Tickly Octopus is a story of a cute octopus who loves to tickle his friends. Its one of CJ's Favorite books and we have been reading it from when she was 2 1/2 years old. I have also blogged about Tickly octopus on my book blog - kidobook. Cj has a fascination to the under sea world and I had the book in our to-buy list. Finally we got it last week. CJ's favorite page is the cover page-Octopus tickling the fishes. So we tried to create the image. 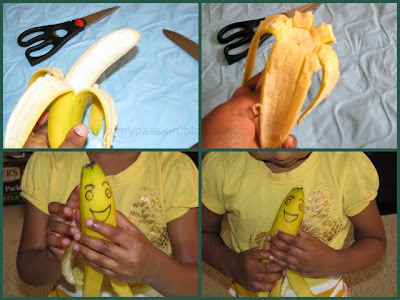 Peel a Banana to 3/4 of its size. With out disturbing the peel, Cut out the white part. Using scissors make slits in the peel to get 8 tentacles . Draw eyes and mouth. Tickly octopus ready! Play around with the octopus and the Goldfish friends. Cj made speedy, twirly motions with the octopus. She also wanted to create page of the Eel and the octopus from the book, we just played along! We had fun time! She was so thrilled of her octopus that she showed it to Dad as soon he came back from work. So easy, cute, and fun, perfect for summer!! I'll have to find this book at the library! Thanks for sharing!! Who says you can't have fun playing with your food?! Sounds like a fun book! And, your recreation of the cover page is so amazing - cute, simple and doable by kids! This made me smile! What a fun little craft and one you could do "on the go" to keep the kids amused! Wonderful! this is such a clever idea ! my 2nd son's favorite animal is the octopus, his favorite color is yellow AND he loves fruit !!! 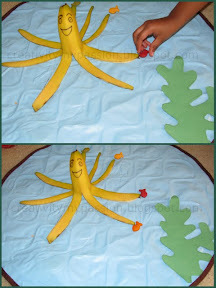 What a great craft idea to go along with reading The Tickly Octopus! Thanks for sharing it with us. As the publisher of tiger tales, it's great to have this sort of creative feedback. Thank you! My pleasure! We just love Tickly octopus book! We had fun doing the project. Now a days my daughter wants to do Tickly octopus whenever she eats a Banana. Smart! 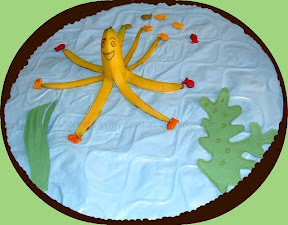 Love the idea of turning banana to octopus! We've made an octopus out of a hotdog but the banana looks even cuter. Love that you drew a face on the skin! This is so cute. I love this! Oh my gosh, awesome! What a fun idea! Thanks for sharing at For the Kids Fridays! Oh what fun! So cute. I've never see goldfish crackers before. Really cathy! Here the goldfish crackers are the most favorite snack @school! This would be so cute next to the watermelon whale at my cousin's bridal shower! Thanks for sharing! I am your newest follower. Come over to Greetings From the Asylum and follow me too! What a healthy craft! Thanks for sharing this idea with us at The Sunday Showcase!